I know, I know … it’s been a while. I’ve been neglecting my blog lately but that doesn’t mean I haven’t been running. In fact, I actually clocked up more miles in January ’19 than I did over the corresponding period last year but most of those miles were Saints and Slimmers related, therefore short-ish runs before and after various different types of exercise classes. To be honest, I was knackered and either too tired to write or to come up with something sensible. 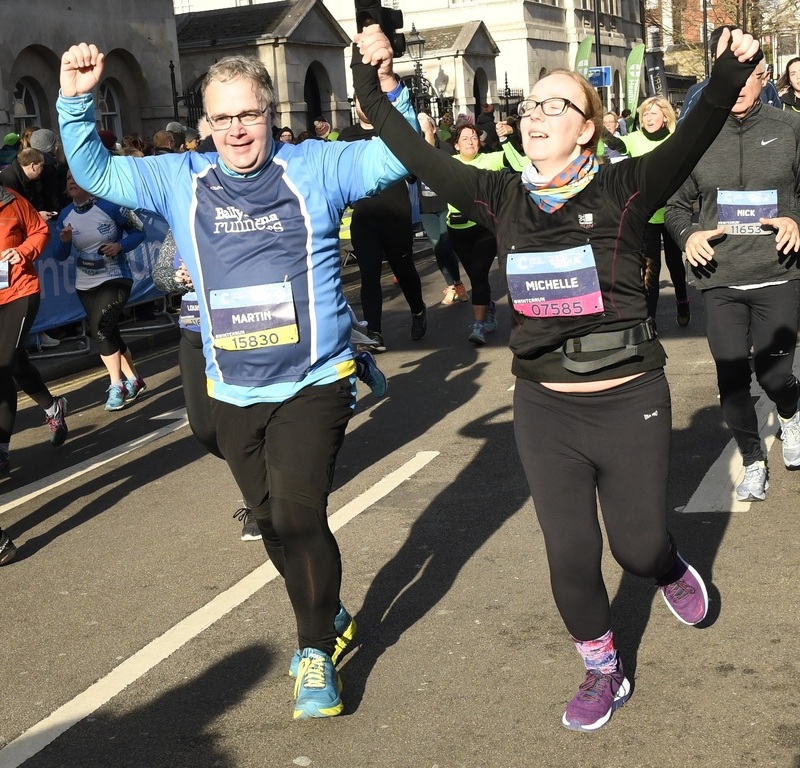 Anyway, at the start of February, I took part in my first race of the year – the London Winter Run 10k – with my daughter Michelle so it would be remiss of me not to document the day. I would just like to say, from the outset, before I’m accused of being some sort of ultra competitive pushy parent, this was her idea. We’ve taken part in the Westminster Mile together for the last couple of years but both days have been super hot. She says she doesn’t like running in the heat but would like to try a longer race when it was cooler therefore the Winter Run seemed perfect when I suggested it. I had previously taken part in the 2017 event so was really looking forward to it. Not only for the occasion itself but for the chance to run with Michelle at another major event. As I said, we’ve done the Westminster Mile together and she also ran a small part of the 2017 London Marathon with me as a Buxton Water Memory Lane competition winner but this was the first opportunity to run with her over a reasonable distance (other than parkrun). But, enough preamble, I’ll get to the point. Getting to Trafalgar Square in good time we did some atmosphere-soaking-up, a bit of merch shopping and availed of the bag drop facilities before joining the throng of runners making their way to the starting pens. A wave system was supposed to be in place but no-one seemed to be heeding it nor was anyone checking so we just joined everyone else. There were all manner of shapes and sizes present, and a kaleidoscope of different coloured bibs around us, so it was obviously more or less a free for all. So off we went … and off Michelle went like a whippet! She’s younger than me and considerably lighter than me so it stands to reason she’ll be faster than me but, as an inexperienced runner, this was too fast for her. I let her go, half impressed but also half wondering if I’d find her waiting around the corner for me somewhere outside Charing Cross Station! And, sure enough, there she was. I could tell she’d paid for her fast start. She had developed a stitch, her breathing was all over the place and she looked like she was really suffering. It was understandable. It was a big occasion and we’ve all done it when the excitement and adrenaline got the better of us. My training and experience kicked in and, pulling rank as her dad, I ordered her to stay with me so that I’d ease her back into the race. She wanted to drop out there and then but I wasn’t having any of that. I knew she’d regret it almost instantly, and I also knew that with a bit of tough love she’d recover. I dialled it right back, and started treating it as week one, day one of Couch to 5k ie: run a minute, walk a minute etc. Even then she was pulled away from me and I had to firmly tell her to stay with me, don’t go past me. I knew if she didn’t we’d be back to square one a little bit down the road. I’m a plodder and plodding was the only way we were going to do this. I did loosen the reins a little at times, telling her to run on if she wanted but, picking out a random runner in front of us, told her not to pass them etc., that way her pace could be regulated. Thankfully things settled down and I think she started to enjoy the experience. I kept talking to distract her, the interaction with other runners was good and we enjoyed taking selfies at the penguin party zone! We then reached a point in the race when she announced that this was the furthest she had ever run, and it was then I knew she’d make it. She seemed to grow in confidence after that point, every step taking her deeper into uncharted territory. She had dug deep. I knew it wasn’t easy for her after her bad start but she had kept going. As we approached Trafalgar Square and the crowds started to build up I felt a great sense of pride. I know we were totally anonymous to everyone there but, for me, it was amazing. At many, many races in the past I have observed, with envy, what were obviously father/daughter partnerships running and finishing together. I wanted that for myself. And now I was getting it. We turned onto Whitehall, and the downhill to the finish. Spine tingling. We put in a big, big finish and, as we approached the line, joined hands and held our arms aloft in victory. It was a fitting celebration. We had done the same during the short Buxton Water Memory Lane run at VLM ’17, so it was quite appropriate to do it this time too. I was so proud of Michelle. She had battled back from a bad start, hadn’t dropped out when she wanted to and had completed her first big race and longest ever run. For me it was my longest run since the Dublin Marathon back in October, and a good base upon which to build for The Big Half in a few weeks time.